Although Pseudomonas aeruginosa has a non-clonal epidemic population structure, recent studies have provided evidence of the existence of epidemic high-risk clones. The aim of this study was to assess the molecular epidemiology of P. aeruginosa isolates responsible for infections in French ICUs, regardless of resistance patterns. For a 1-year period, all non-duplicate P. aeruginosa isolated from bacteremia and pulmonary infections in ten adult ICUs of six French university hospitals were characterized by antimicrobial susceptibility testing and genotyping (MLST and PFGE). We identified β-lactamases with an extended spectrum phenotypically and by sequencing. The 104 isolates tested were distributed in 46 STs, of which 7 epidemic high-risk (EHR) clones over-represented: ST111, ST175, ST235, ST244, ST253, ST308, and ST395. Multidrug-resistant (MDR) isolates mostly clustered in these EHR clones, which frequently spread within hospitals. Only one ST233 isolate produced the carbapenemase VIM-2. PFGE analysis suggests frequent intra-hospital cross-transmission involving EHR clones. For ST395 and ST308, we also observed the progression from wild-type to MDR resistance pattern within the same PFGE pattern. 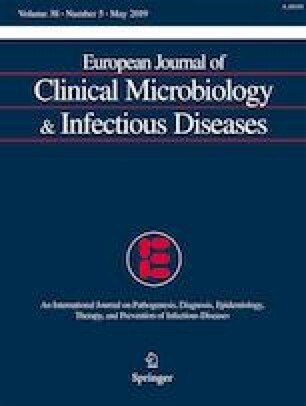 Molecular epidemiology of P. aeruginosa in French ICUs is characterized by high clonal diversity notably among antimicrobial susceptible isolates and the over-representation of EHR clones, particularly within MDR isolates, even though multidrug resistance is not a constant inherent trait of EHR clones. We thank the ICUs (Gilles Capellier, Emmanuel Samain, Christian Auboyer, Fabrice Zéni, Christophe Mariat, Anne-Charlotte Tellier, Martine Ferandière, François Lagarrigue, Charlotte Arbelot, Corinne Vezinet), microbiology laboratories (Anne Carricajo, Florence Grattard, Julie Gagnaire, Hanaa Benmansour), and infection control teams of the six participating centers. This work was supported by the French Ministry of Health (PHRC national 2011). CS participated in the design of the study, acquisition of data, coordinated the study and in the article redaction. JR, NvdMM, PB, AMR, and VD participated in the acquisition of data and in the article redaction. PC and MT carried out the bacterial typing. DH coordinated the bacteriology study and participated in the redaction. XB conceived the study, participated in the acquisition of data in its design, and wrote the article. Approval and written informed consent from all subjects or their legally authorized representatives were obtained before study initiation. The study was approved by the ethical committee “Comité d’Etude Clinique” of the Besançon University Hospital, Besançon, France, references: 2011-A01013-38.